There is an interesting article in Deutsche Welle describing the plight of forced laborers interned in Nazi ghettos such as that in Warsaw and other cities. Many of those persons are making pension claims before the German government due to their assertion they were de facto employees of the German government at the time. Eventually the German government, made provisions to facilitate receipts of pension, the bureaucratic process unfortunately led to years delays and denials, with as a consequence either intentionally or unintentionally led to the government having less of a pension liability due to the aging population passing away. 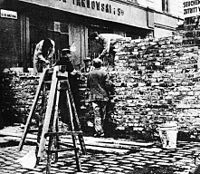 Like those in the hundreds of other ghettos the Nazis set up across Europe, many Warsaw ghetto residents tried to improve their living conditions by working, earning either money or food as payment. But that didn’t mean that the former ghetto workers received their pensions from the German state straight away. The ghetto pension law was only passed in 2002, by the Social Democrat/Green coalition of Chancellor Gerhard Schröder, which made former ghetto workers entitled to pension payments from 1997 onwards. The law followed a ruling by Germany’s Federal Social Court about the Lodz ghetto. This claim is supported by the figures: close to 95 percent of pension applications by former ghetto workers were turned down. Many took their cases to social courts, and lost. They were faced with high bureaucratic hurdles. The courts would often turn down the applications on the grounds that ‘voluntary’ ghetto work was the same as forced labor. The Federal Social Court eventually adjusted its ruling in 2009, a revision meant that many former ghetto workers managed to get their pension payments at last, but their claims were only valid from 2005, not 1997, as originally foreseen. According to German daily Die Welt, that means some 38,000 of the total 50,000 ghetto pension recipients aren’t receiving enough money. Now Chancellor Angela Merkel’s third government is making moves to change that. “With her draft law, Social Affairs Minister Andrea Nahles is attempting to remove the hurdles she deems unacceptable: the problematic four-year-rule and the issue of the due date by which an application has to have been filed,” was how a ministry spokeswoman described the government’s reform plans. The former ghetto workers are merely demanding what they’re owed – though it will come too late for many. Is Rep. Paul Ryan a Lazy White Man? There is some aspect of this which America could adopt. There are millions of Americans receiving money and food vouchers because they have children. Gather up the moms, and dads when you can find them, and put them to work cleaning streets and nursing homes. Collective work for collecting money. The magnanimity of it is breathtaking? i’m with raff on this. they shouldn’t be rewarded for trying to run out the clock on someones life. If payments aren’t allowed to descendants, it rewards the governments delays in justice. Annie.. Because of the delay and games I am with you…. Normally, I would say that the descendants were not entitled…. Take for instance the other provisions of the US 14th amendment….no compensation for property taken….ie human….. This is interesting as the Indian or native Americans are finally getting some justice for lands taken here…. There were many areas in Germany of forced labor…. Including the Volkswagen ….. This was a nazi regime auto company…..
Darren… Excellent article…. I got interested in this subject matter after reading the ultra secret and qbVII….. Absolutely phenomenal… And then with Mike S…. His family history…. And story’s i do recall…. From my own family….. I am very much against payments to descendants. I am for the pension. A lump sum to descendants, not payments. Germany should be giving these pension payouts to next of kin if the ghetto worker has passed away. Germany seems to be doing well financially and it would only a small gesture of reconciliation to these families for the wrong Germany did during those years to them. Interesting piece. You find a variety of topics. I believe the people who suffered deserve compensation. I do not believe their descendants do. If you get my drift.